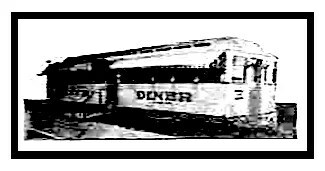 The Mor-Lan Dining Car works of Lewiston Maine appears to have been around from 1932 to late 1934 or 1935. They built one confirmed diner, and with the three year window of operation, possibly more than that. The company was founded by L Moreau and Louis Lantagne. Moreau seems to have been the design and build part of the equation, with Lantagne filling in more on the money side of things. 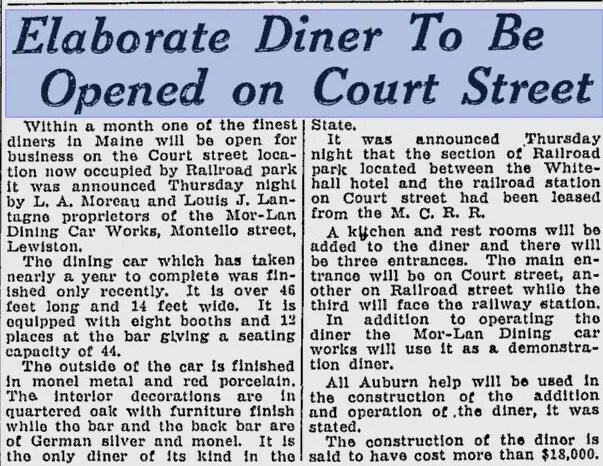 An article from November 1934 confirms the existence of the company as of that date, and lists Moreau as the owner of the first showcase diner listed in the above article. By early 1936, Moreau had sold the diner. 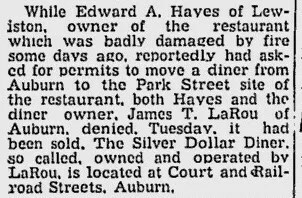 In 1944, the Hayes Diner, of 101 Park Street, Lewiston, Maine burned down. The diner was moved from the site and the Silver Dollar Diner, built by Mor-Lan was moved via the North Bridge to the site as a replacement. 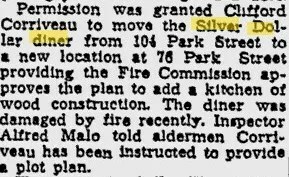 At this point, the Silver Dollar Diner was owned by a James T. LaRou (The Jimmy of Jimmy’s Diner) and the Hayes Diner was owned by Edward A. Hayes. Though LaRou denies it in this article, the deal did go through and the diner was re-located. Here is a shot of Hayes Diner, which I gather was also built in 1933. 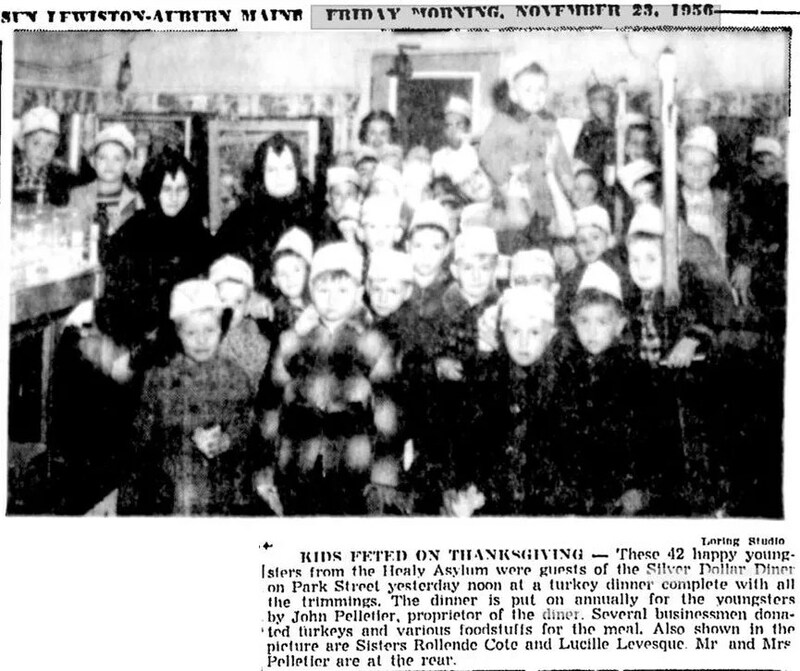 In 1950, the diner was moved again, this time to 76 Park Street, Lewiston, Maine. 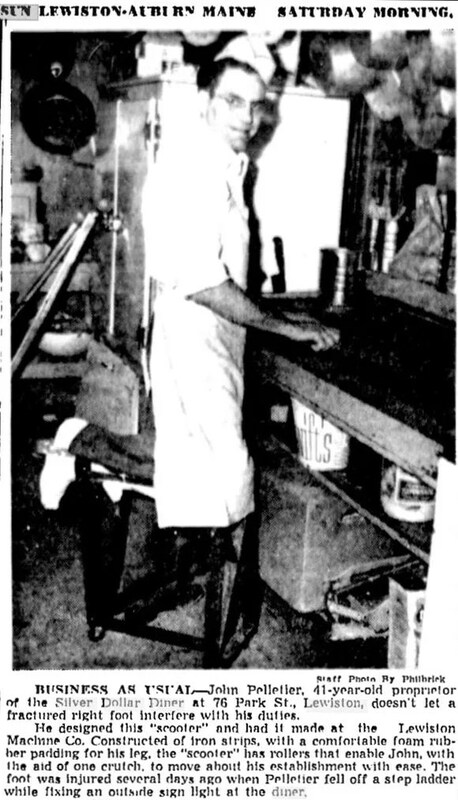 By 1955, the diner was owned by John Pelletier, shown here in the kitchen. And here is a shot of the inside of the diner. Unfortunately, it doesn’t really show a lot about the place. The diner experienced a small fire to the roof in 1957, but it re-opened and by 1960 was owned by Alfred and John Murphy. 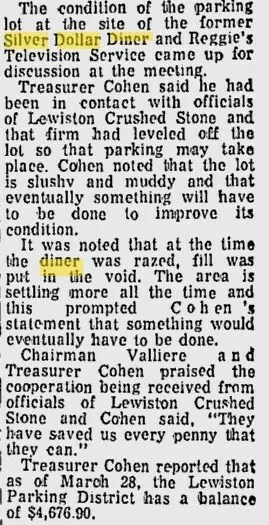 By 1967, the diner had been demolished and was replaced with a parking lot. Moreau passed away in 1982. Though he only stayed in the diner business for several years, he went on to a long career in other construction fields. A special thanks to Mike Engle for finding the initial article in his research! What database are you using to access these articles? Google News. The Lewiston-Auburn paper is free access, which is nice. I shudder to think how much I’ve spent with proquest for Baltimore and Washington archive research.